Kurt Cobain: Montage of Heck is unlike any documentary about music that I’ve ever seen. A doc that was authorized by the Cobain family, it chronicles the entire life of Kurt Cobain, the former lead singer/guitarist of Nirvana, who took his own life in 1994, at the height of Nirvana’s popularity. But what sets this film apart from your run of the mill documentary with a bunch of talking head interviews about the subject is that this film truly goes into the head of Kurt Cobain, and director Brett Morgan takes you in the twisted, psychotic, terrifying but fascinating and brilliant mind of Kurt Cobain, as shown in these animated sequences involving his art and lyrics. Brett Morgan, whose known for doing out of the norm but always fascinating documentaries (he did a brilliant doc about the Rolling Stones and the day when O.J. Simpson was arrested) takes this very unusual but fascinating and really stellar route in telling the story of one of the most influential figures of the last 20+ years. Here’s my review of Kurt Cobain: Montage of Heck. There are a couple of talking head interviews, but its a select core of people who were special to Cobain. His mother, his father, his sister, his ex-girlfriend, Courtney Love, and Krist Novelselic, the bassist of Nirvana (the director explained that Dave Grohl couldn’t make the scheduled times for an interview). These interviews don’t pop up as much as you think they would, as most of the film are these home movies from the Cobain family, where we see little Kurt Cobain as a baby, then later on we see home movies of Kurt on the road and with his wife Courtney Love with their child. This is the main drawing point to Montage of Heck, since we are finally getting to see footage from Kurt’s life, and get a behind the scenes look of what this man was like, and from the beginning you can tell that it will not end well for this troubled musician. As I mentioned before, there is imagery and footage of a young Cobain’s drawings that go inside his very troubled mind in some very dark but beautifully done animated sequences, as well as animated scenes that help visualize some of Cobain’s audio recordings of him talking about his life, with the animation style feeling and looking a little like the animation style that Richard Linklater used in Waking Life and A Scanner Darkly. It’s quite beautiful and very moody, with this really haunting but really beautiful string arrangement of some of Nirvana’s most famous songs that play in many of these sequences. These sequences are what makes Kurt Cobain: Montage of Heck arguably the most personal documentary that I’ve ever seen. I came into the film feeling a certain way about Kurt Cobain, and after the film, I felt a totally different connection with the artist, which is really something. 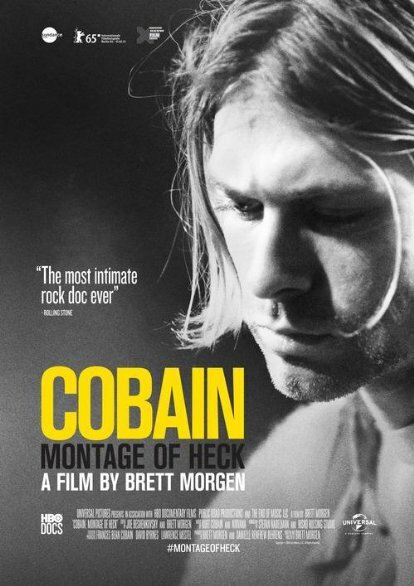 Montage of Heck may be the best film I’ve seen at SXSW, but its a painful film to watch and see the slow downfall of Cobain being described on-screen by his loved ones, his art, and his home movies. The film will premiere on HBO on May 4th, so I highly recommend you set your DVR for that one. If you’re a fan of Nirvana or just a fan of music documentaries, this is one of the more unique pieces of documentary filmmaking that I’ve ever seen, and is a film that must be seen.